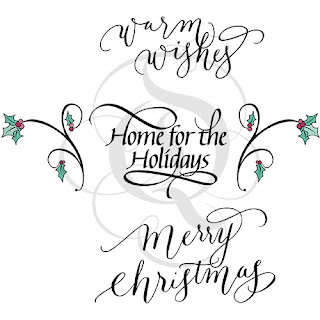 I hope that you all had an amazing Christmas Holiday yesterday!! I love this time of year and hopes of starting a new year with even more special things planned always keeps me in good spirits and i can't wait to start 2018. Can you believe it's almost a New Year? So-- with all of that in mind--- i thought i would create a card that i could send to a special friend for always being there for me. I think everyone has them and receiving a special card would be really nice even for me. 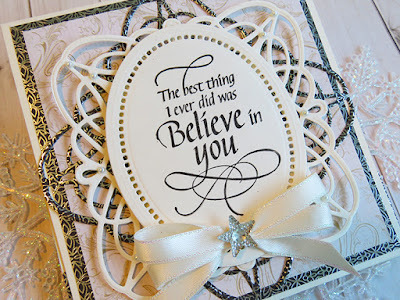 I created my card using one of the new Cling Rubber stamps called "The best thing- Believe in you" and i wanted to keep it simple so i used a pretty hemstitch oval die by Becca Feeken to stamp my sentiment in black and that way it would stand out great with the Kaisercraft papers that i used. 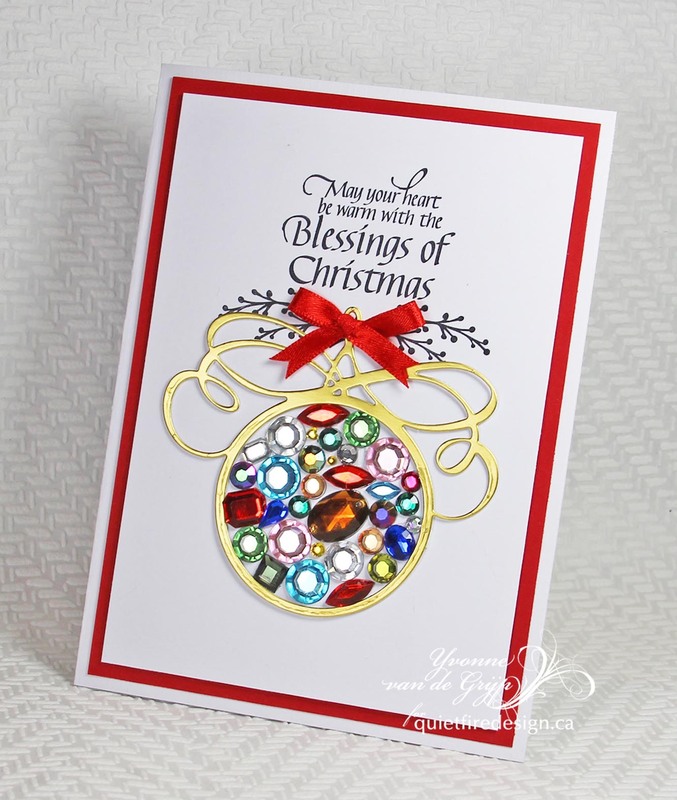 And behind the oval die is another of Becca Feeken's dies called "Braided Grace Square". 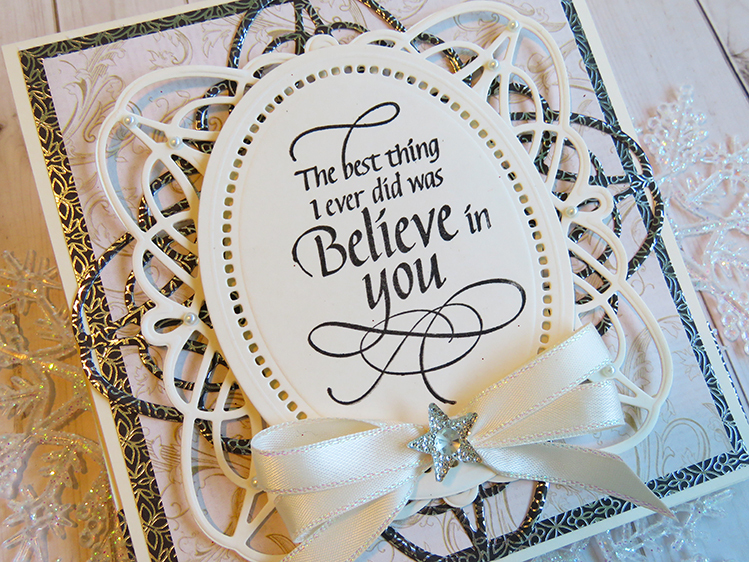 I made two of them one in each of the papers and alternated the pattern to create a pretty back round under my gorgeous sentiment. And i just finished it with a pretty ivory bow and a sparkling star. It's simple yet really elegant... just how i like it. And i hope you do too! I hope you are having a wonderful day and thank you so much taking the time out to visit - I really appreciate it! So who knows someone with a birthday in December and it just gets kind of lost in the holiday craze? Well, this is the card for them! 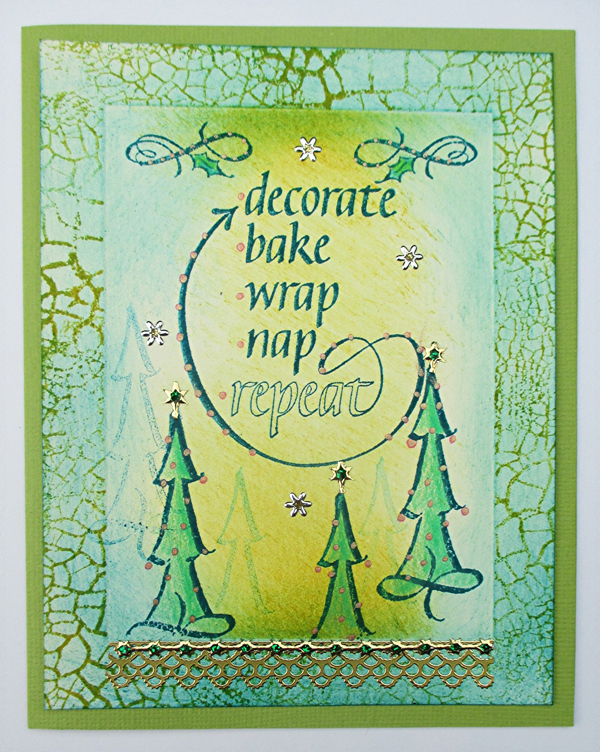 Well, it's for anytime of the year - pretty versatile card here - but I made it with December birthdays in mind. 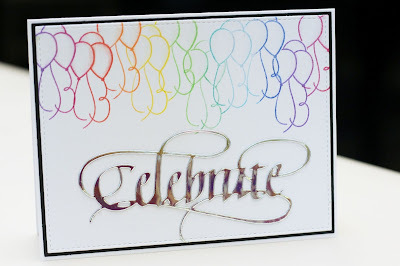 You can easily change out the Celebrate die for the small Happy Birthday die. 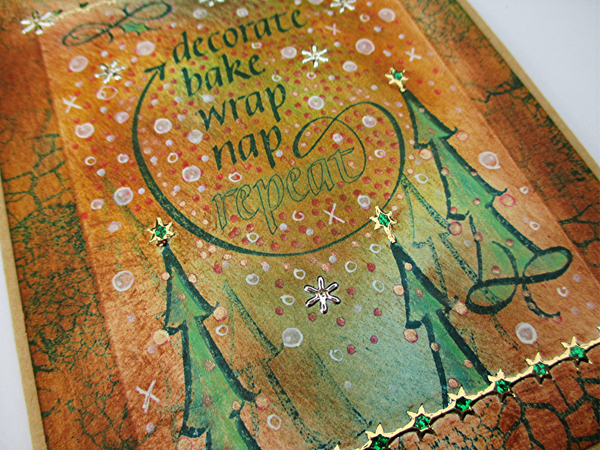 It's quick but all sorts of shimmery thanks to the Shimmer Sheetz from Elizabeth Craft Designs. I think the Shimmer Sheetz and the black matting really helps elevate this otherwise simple card. What do you think? 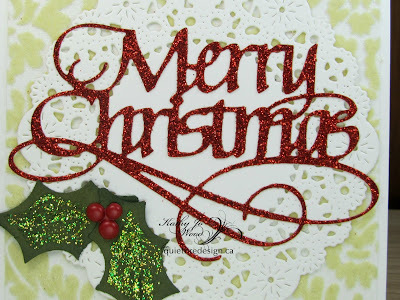 Hello, Connie Nichol here today with a couple of quick Christmas cards. I had some shipping tags laying around, and some dies and Christmas stamps designed by Suzanne Cannon and some Elizabeth Craft Designs shimmer sheetz, and one thing led to another...... These cards are very simple, but the design is versatile. 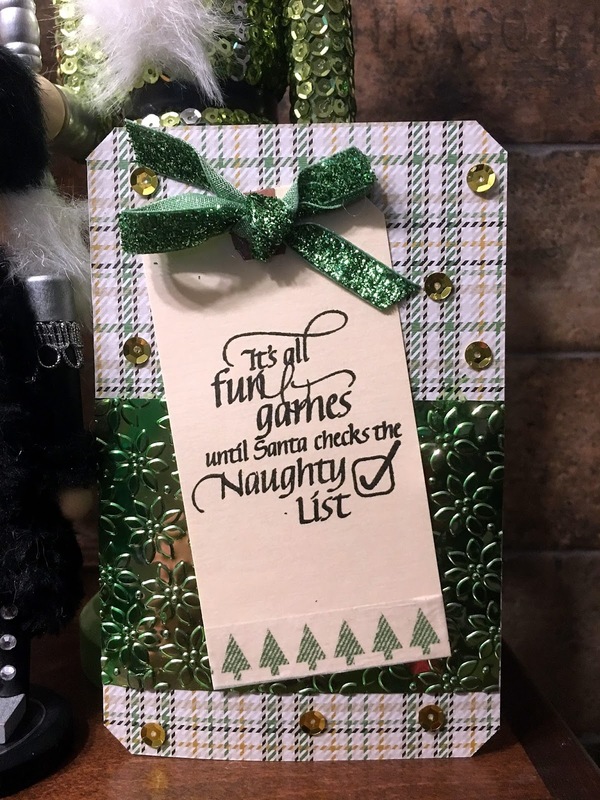 You can use different stamps and dies on the tag and make a whole pile of different cards. 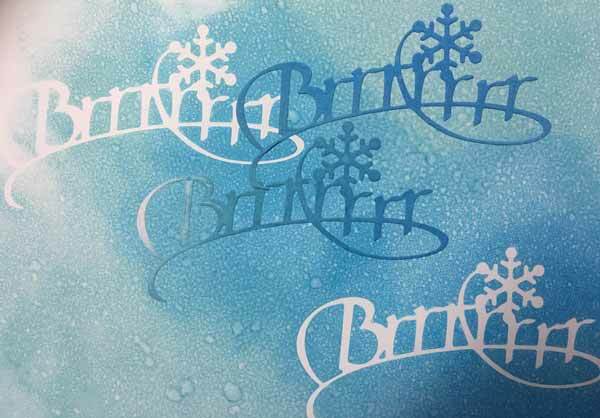 Shimmer sheetz are iridescent Mylar sheets and they become extra beautiful when dry embossed with an embossing folder and a manual die cutting machine. 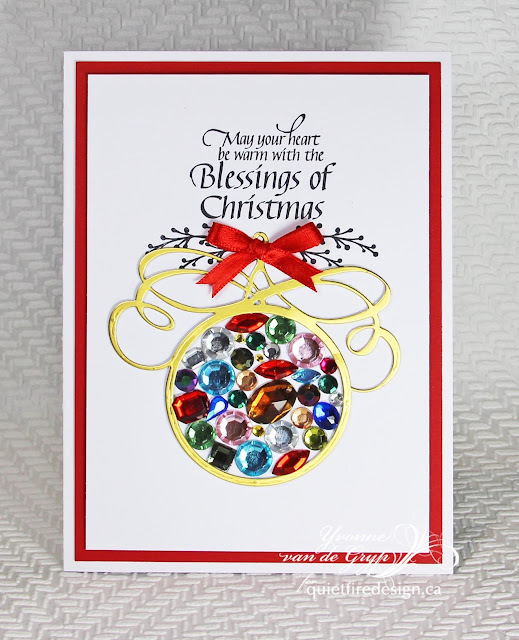 A piece of shimmery Mylar and a few sequins make the cards look very shiny and festive. And the stamp is from the clear acrylic Merry Christmas collection shown here. This is such a large versatile set. 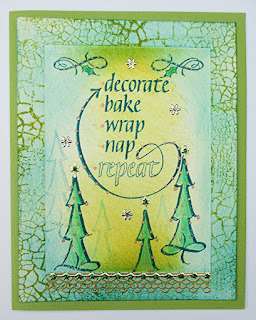 Supplies Used: Elizabeth Craft Designs stamps, metal die, shimmer sheetz, Stampin Up! 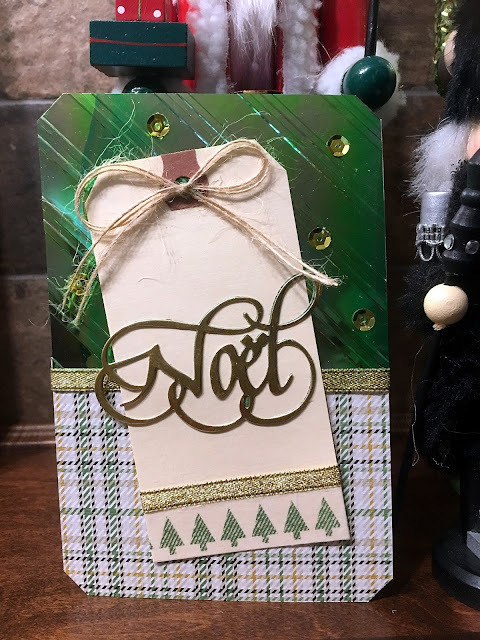 embossing folder, Big Shot, patterned paper, washi tape and corner punch, May Arts ribbon, Dollarama sequins, Beacon 3 in 1 adhesive. 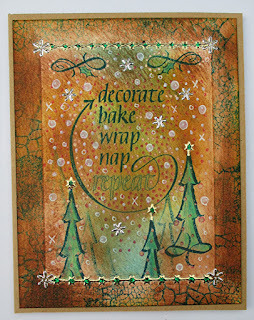 This month's challenge over at Elizabeth Craft Designs was a background challenge. So this was fun! All you have to do is die cut your words from a removable mask, lay them on your paper, sponge colour over them, spritz with water and repeat! The variety is endless! My theme is winter, but I could easily stamp Merry Christmas on the inside and voila! a Christmas card! Or what about a birthday card, or anniversary.... or .... or.....or...! 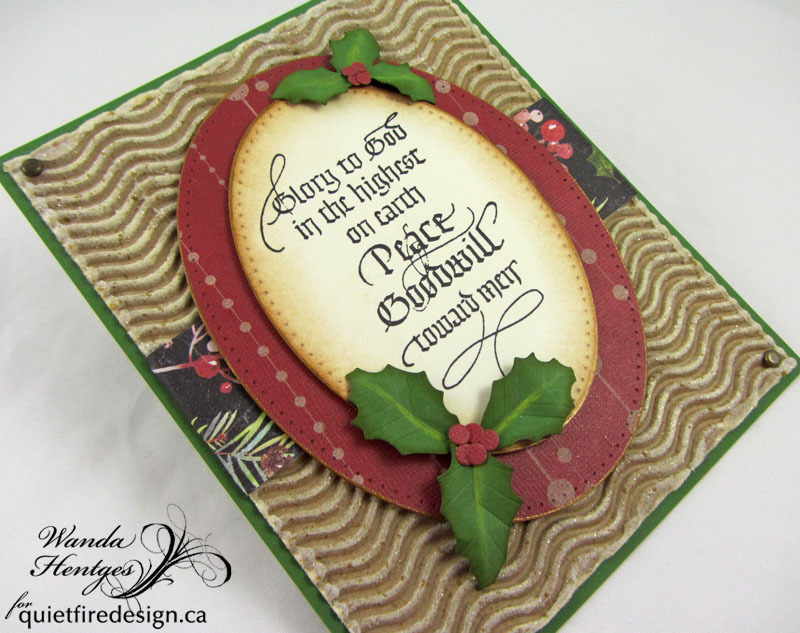 For today's challenge, Elizabeth Craft Designs will be giving away Gift Card to use on their website to 3 lucky winners. To enter, simply leave a comment on the Elizabeth Craft Designs Challenge Blog Post! Good luck! 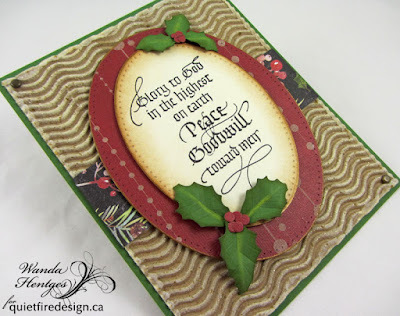 Here is how to make this card. It's such a fun technique! 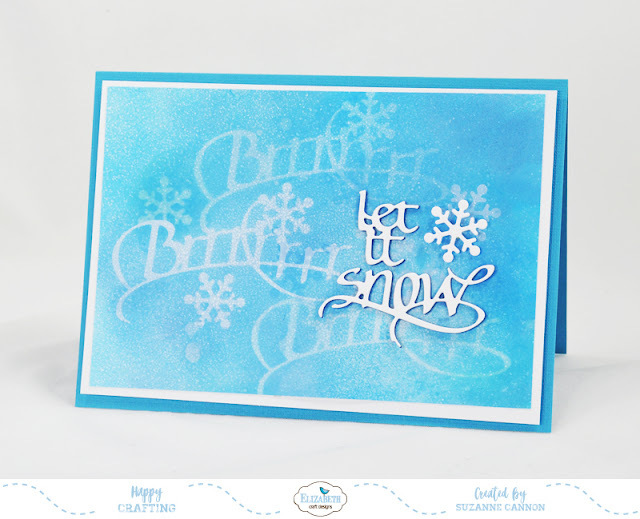 ECD Supplies: Elizabeth Craft Designs, Inc.
Form a 7 x 5" tent-fold card base from blue (Nassau) cardstock. Cut a piece of Specialty Stamping Paper about 7 x 5". You will trim this later to fit the card front. Remove the masked images and move them to a new place on the paper. Yes, they'll still be sticky enough to work! Now sponge Broken China over and around parts of the masked words. Spritz again and allow to dry. Repeat with Faded Jeans Distress Oxide Ink. Remove the masking words. Trim to 6.5 x 4.5". 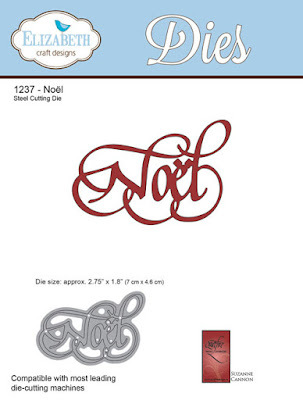 Cut a mat from white cardstock approximately 1/8" and adhere together. 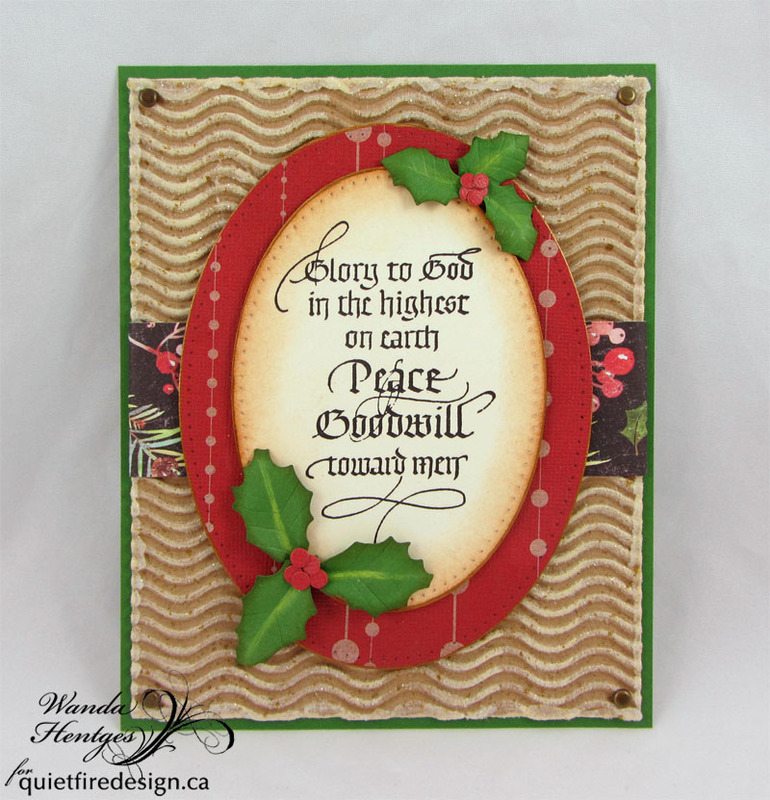 Mount this panel on the card base with foam adhesive. Die cut Let it Snow twice, once from white cardstock and once from dark blue (Royal). 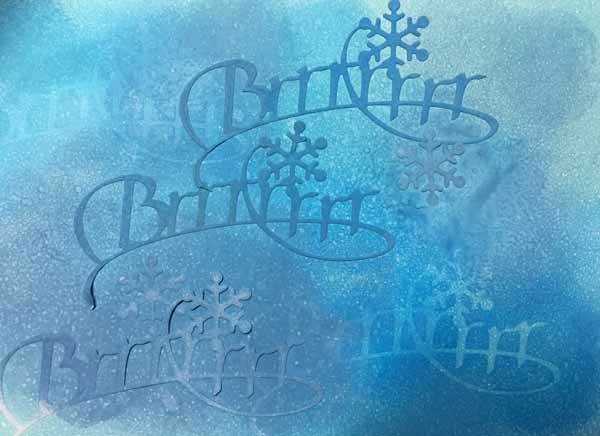 Die cut one snowflake from white. Layer them with the dark words slightly offset to create a slight dropshadow effect. Adhere the words and snowflake to the paper as shown. Have fun with this technique. The effect can be very subtle or very stark. Try them both. Mix up your Distress Ink colours. And there are lots of words you can use as a background!! Thanks for visiting. 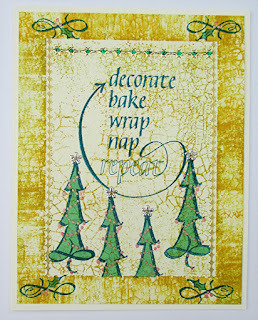 Now head over the the Elizabeth Craft Designs blog to enter to win! Oh- we are so close to the holidays now. This season has flown by! 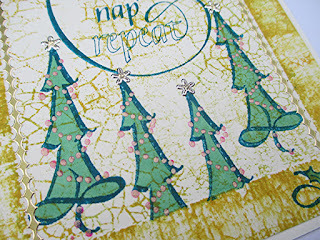 Now I am using the cards created thus far...and quickly making last minute cards, too. 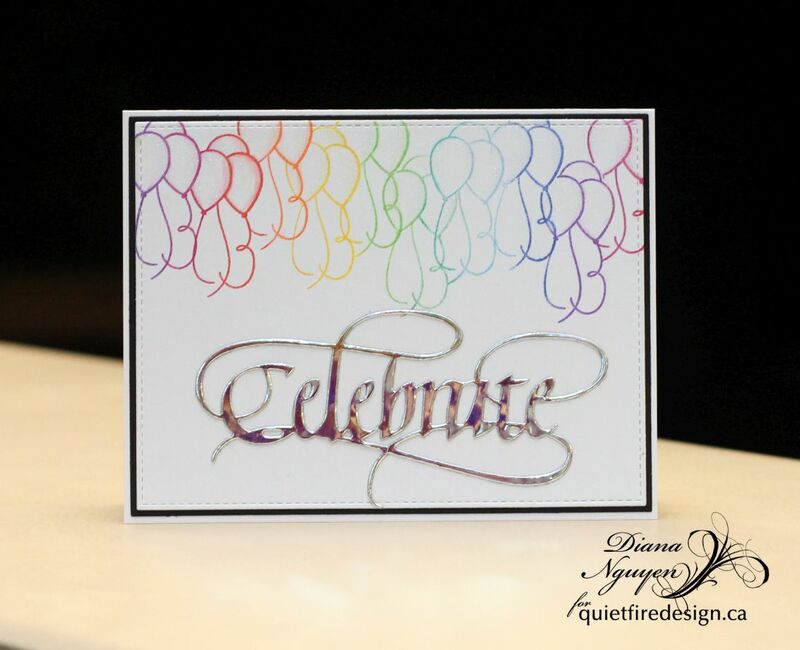 One of the many reasons why I love Suzanne's dies is the fact that the dies help to make a gorgeous card in a flash. Today I am sharing one of those quick cards. The card's focal point is the beautiful Merry Christmas die. The die was used to cut some red glitter paper. Isn't it stunning? Create a top fold 5 x 5 card using white card stock. 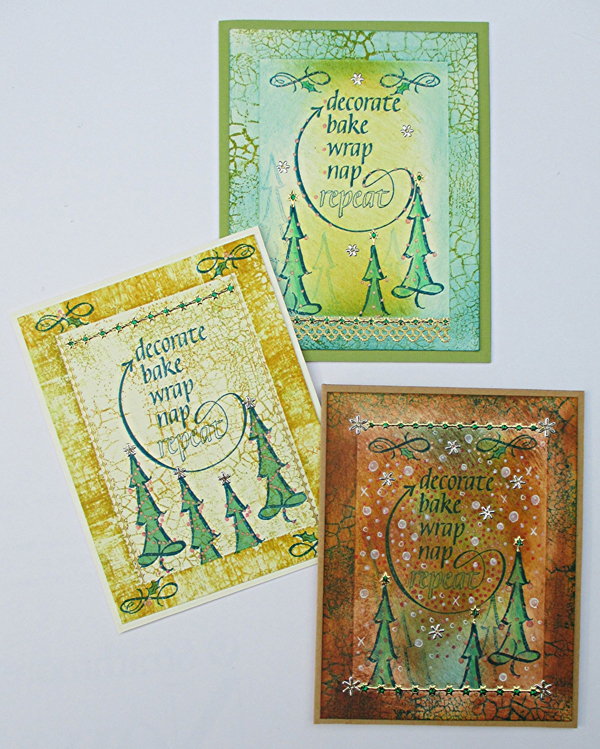 Cut patterned paper smaller than 5 x 5 and mount to card base. 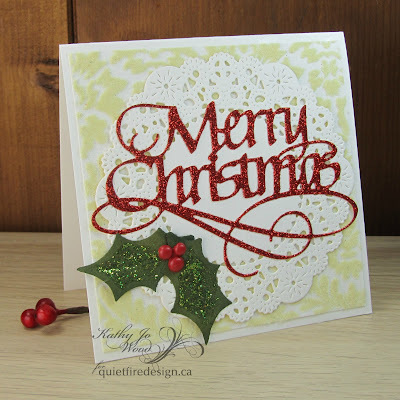 Adhere Merry Christmas to doily using liquid adhesive. Thanks for stopping by! I do hope you enjoyed the quick card! See below for the cutting and construction details. Before the box was glued together to make the box card, I decorated the inside by stamping the cloud background (Impression Obsession Cover A Card "Clouds") inking with various Distress blues. 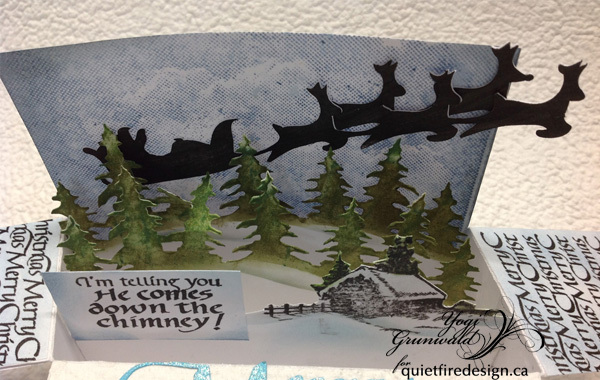 Electronically cut the Santa sleigh & reindeers from white cardstock and colored while still on my mat using Distress dabbers "Black Soot". I cut off the first 2 reindeer and adhered them to the back of the other 3 reindeer. That way I was able to cut my image larger than would fit on my card... Adhered to clouds. 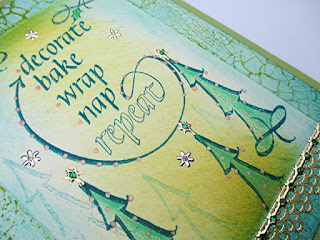 Die cut the evergreen trees a couple times (Tim's On The Edge "Tree Line") then colored with various Distress green's. Used the edge of a piece of cardstock to create shadow on the hill, sponging with "Stormy Sky". 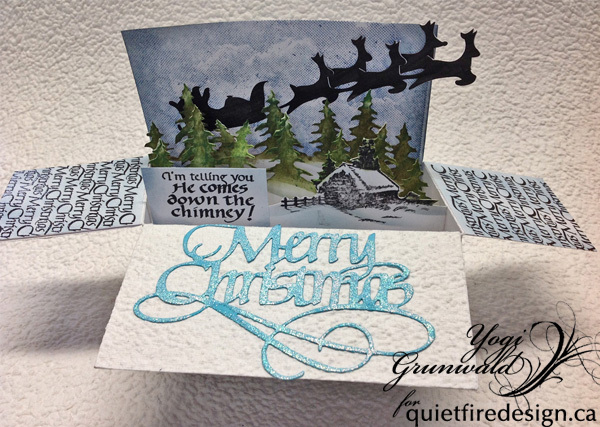 Stamped the house (AlteNew "Winter Cottage") using Versafne Black Onyx and clear embossed. Fussy cut around the top edge. Trimmed down the 3 layers as suggested below adding the 1/4" tabs to adhere to the box sides. 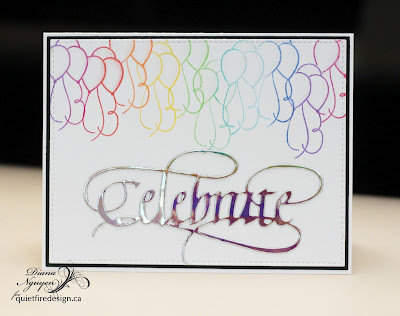 Stamped the quote onto a piece of white cardstock using the black, clear embossed and trimmed close to stamping. Sponged some blue around the edges and adhered to the house insert strip. 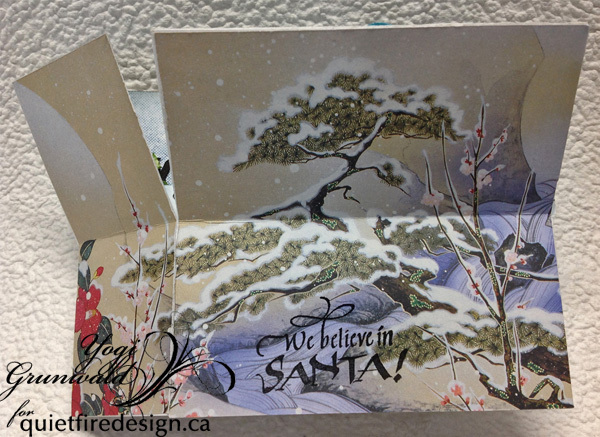 On the side flaps: Stamped the "Merry Christmas Background" onto white cardstock using the black and clear embossed. Sponged some of the blue lightly all over and trimmed down and adhered to fit edge to edge on both flaps. On the large flap I adhered a piece of heavy texture white heavy paper (Coral Reef paper) edge to edge. 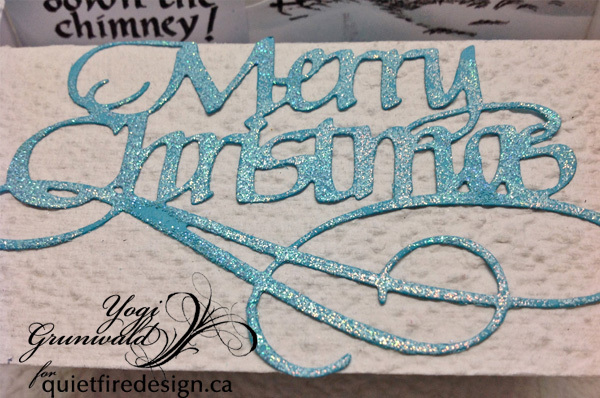 Die cut the Merry Christmas from a light blue cardstock, then inked it with Versamark and embossed with Emerald Creek "Turquoise Shimmer" embossing powder. Adhered to flap. Stamped the sentiment with the black and clear embossed. Please note, the back panel does not have a score line down the middle, only the front piece does... 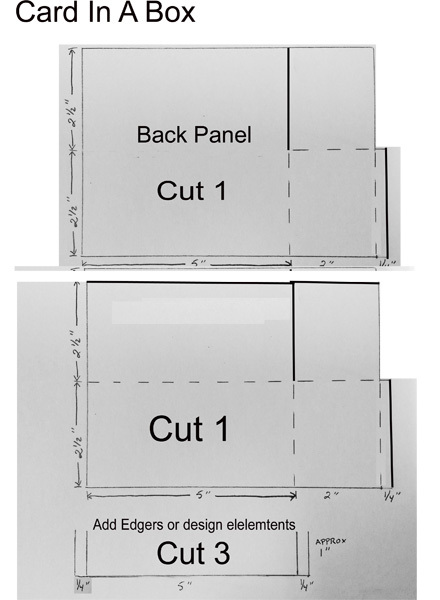 If you've accidentally scored it, then cut another piece of cardstock the same size as back and adhere so that it remains as a stiff upright panel. When ready to assemble, apply glue to the back panel tab and adhere to the inside of the front panel un-tabed side. After trimming and decorating the strips, adhere the right hand tab to the partially assembled side, aligning it with the center fold. Continue with other two strips, leaving even spaces between the strips. Apply double sided adhesive to the left hand tabs, make sure your strips are aligned properly, then fold over the front panel and press down to adhere. Adhere the card front panel tab to create the box. Voila, you're done. Another option is to totally create and adhere the box and strips to create the card, then just adhere die cuts to the edge of each strip. Easy Peasy. Yvonne here with a jewel Christmas card. 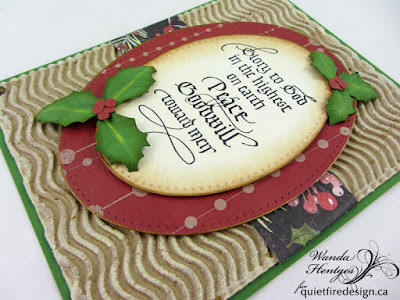 For my card I used the new Quietfire Design stamp "May Your Heart Be Warm", as well as a cutting die from the set "Love Joy Peace Christmas Ornament. 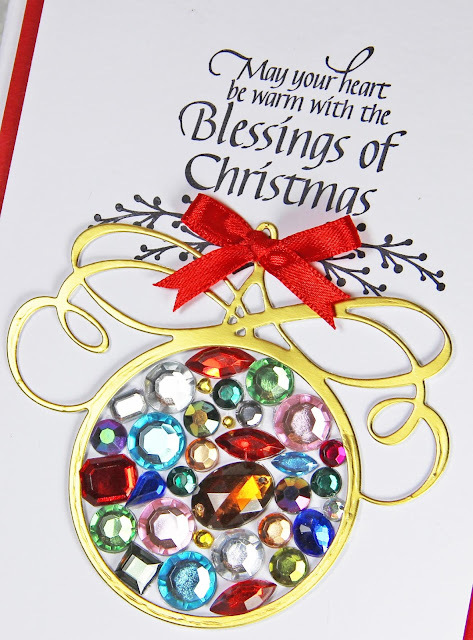 The ornament is die-cut from gold cardstock and glued upon the card using 3D foam squares (cut into small stripes to fit the die-cut). Then rhinestones were randomly glued into the ornament. Wishing you happy Christmas crafting! 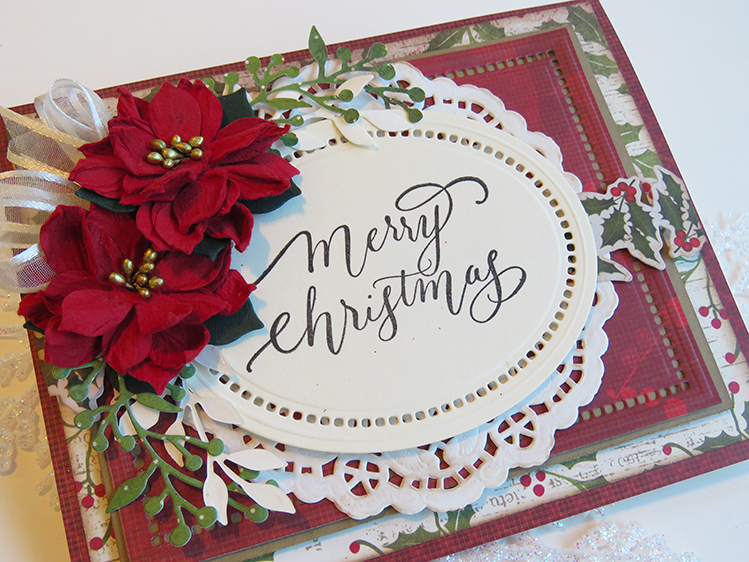 Hi everyone and it's so nice to have you stop by our blog today to see what is new for the holidays. Today i am sharing a pretty card that i made with one of Suzanne's newest stamp sets called "Home for the Holidays" sentiments. 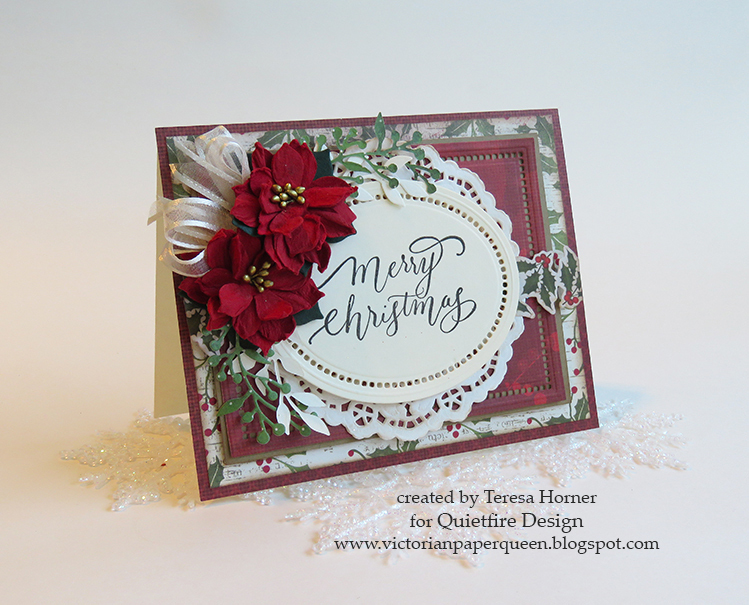 This is a gorgeous set with 5 stamps in it that you can use for your cards this year. I made my card super simple with just a few dies, ribbon and some poinsettia's. 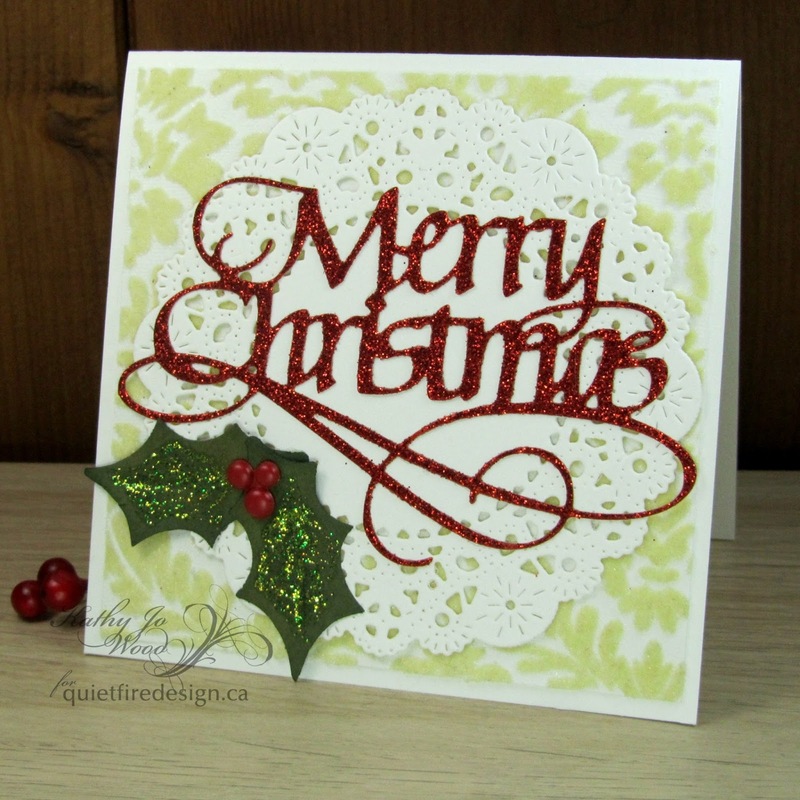 I went really traditional with it and mixed lots of ivory, red and green and the extra doily behind the die gives it a really country feel i think. The dies are by Becca Feeken and the little hemstitch detail really sets off the sentiment. It's perfect and is going to a special co worker for Christmas this year. Here is the stamp set with all the other pieces in it. As you can see there are lots of other gorgeous designs in the set that you can use for tags and other projects this year. 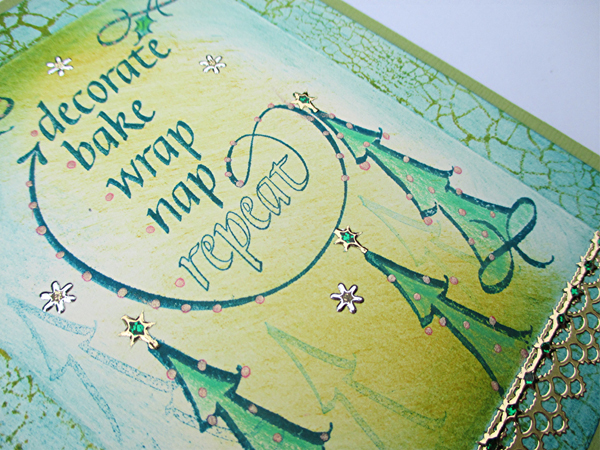 Decorate, Bake, Wrap, Nap, Repeat…Those words just about sum up the holiday season in a single stamp, don’t you think? But why stop at just one stamp when there are so many more to play with? Dip into your collection or do a little shopping to add whatever else you think would look just right! 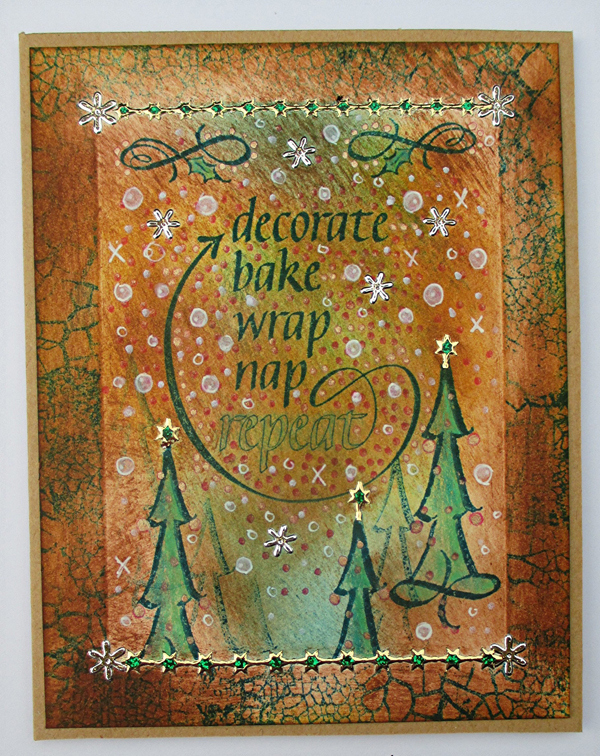 I mixed in Quietfire Design’s crackle pattern background, flourished tree and holly flourish stamps, did a bit of coloring and doodling, and embellished with glittery and gold peel-offs. The top layer with raised border is a panel card, sold by printing companies to use for invitations and reply cards, but if those aren’t available simply mask off a rectangle and smudge on some inks with a craft sponge to create the frame. (Masking was needed even with the raised border). Each side-fold card base is solid color cardstock, chosen to coordinate with the stamped and embellished layer. Tip: It is usually easier to choose the card base last rather than first, and it doesn’t have to be a solid color! 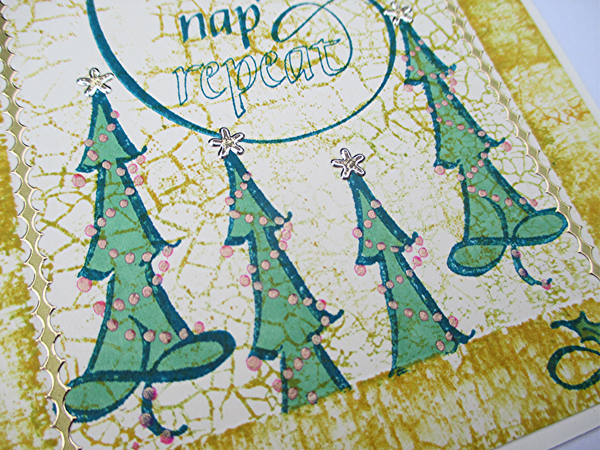 Get out some cardstock-weight patterned scrapbook paper and use it instead. 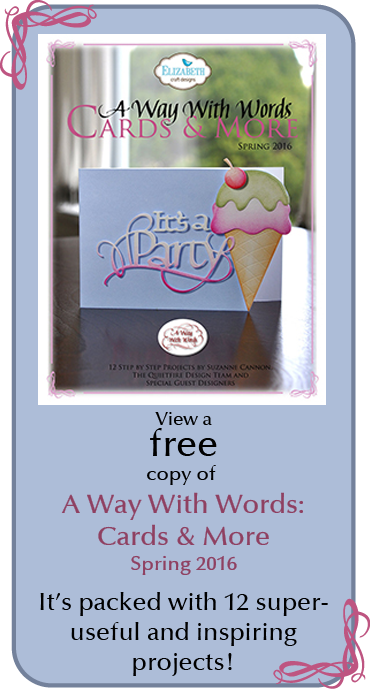 Please use these whimsical cards as inspiration. Go for whatever color combination you prefer. As usual, I picked a quirky off-beat palette rather than traditional. Doodle and draw, or not. 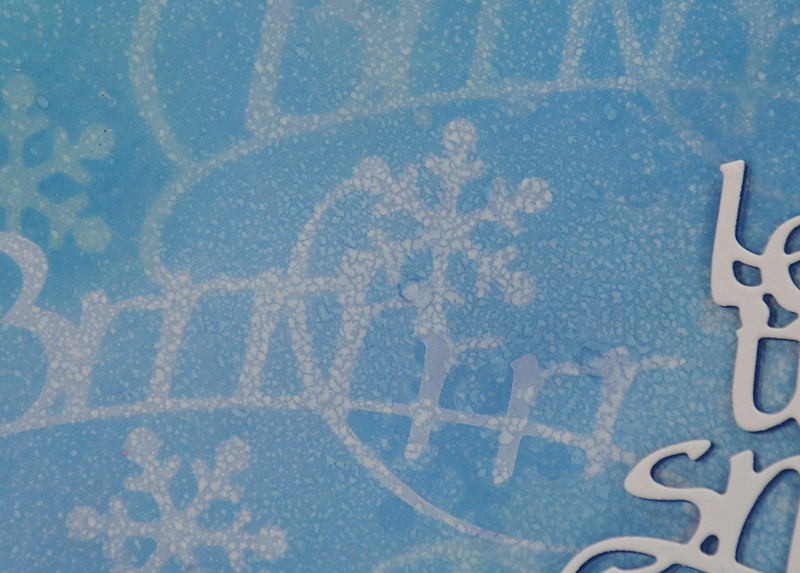 Add border peel-offs, tiny six-petal flower peel-offs as snowflakes, top the trees with glittery stars! Or keep it simple. 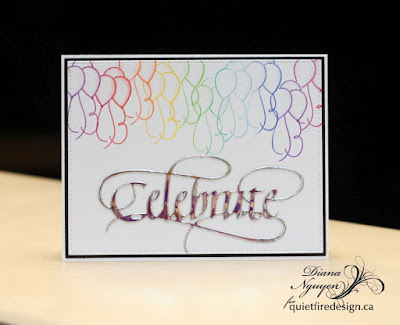 Stamp, smudge on a bit of color – Done!